Hope you had a fabulous weekend! 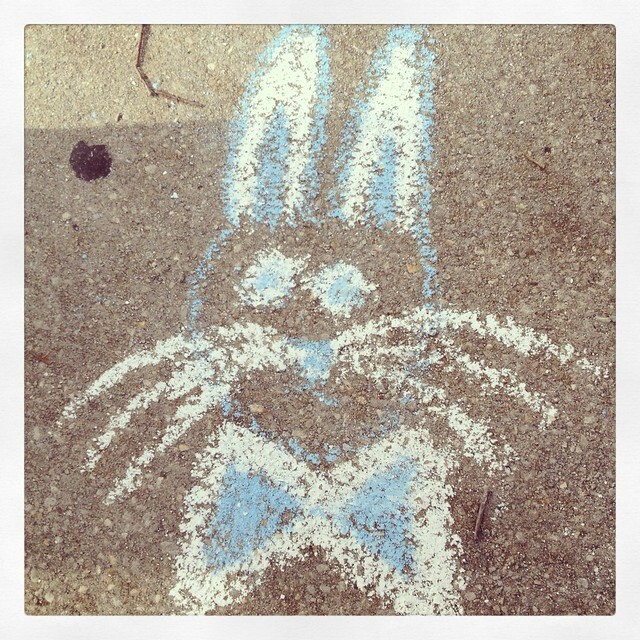 And a belated happy Easter to those who celebrate. Followed by a trip over to my Great Aunt’s house for a big family gathering, then a trip to a local park to hang out with some friends. It was a lovely day. Gorgeous weather too. As usual, I contributed one of the desserts to the family Easter meal. This time I decided to make something that my mom used to make when I was growing up. She passed the recipe onto me, and whenever I make it, it’s always a HUGE hit. 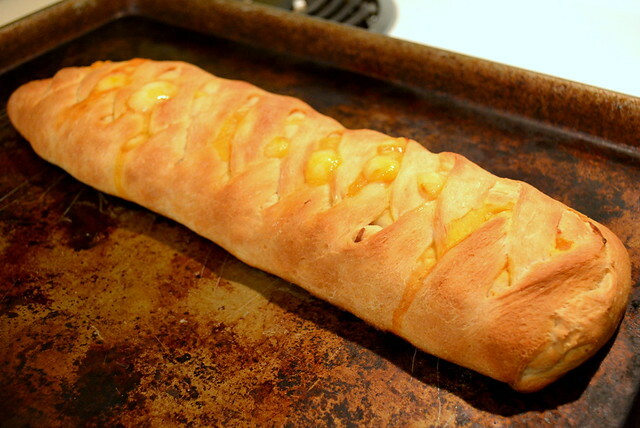 It’s a great warm weather recipe, because it doesn’t require use of the oven. 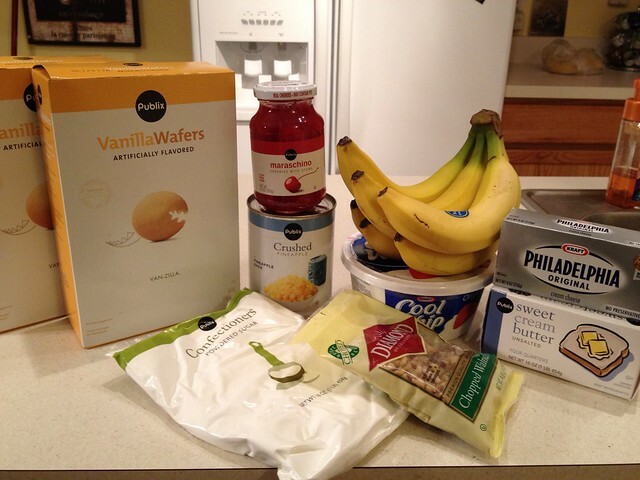 The first step is Tadd’s favorite part…Crush the vanilla wafers (click the link for an amazing demonstration of this important step)! Melt the butter and combine with the crushed wafers. Press evenly into the bottom of a 9×13 pan. Mix the cream cheese and sugar until it has a creamy, frosting-like consistency. Spread over the vanilla wafer crust. Drain the pineapples and spoon in an even layer over the cream cheese. Slice the bananas and place on top of the pineapple layer. 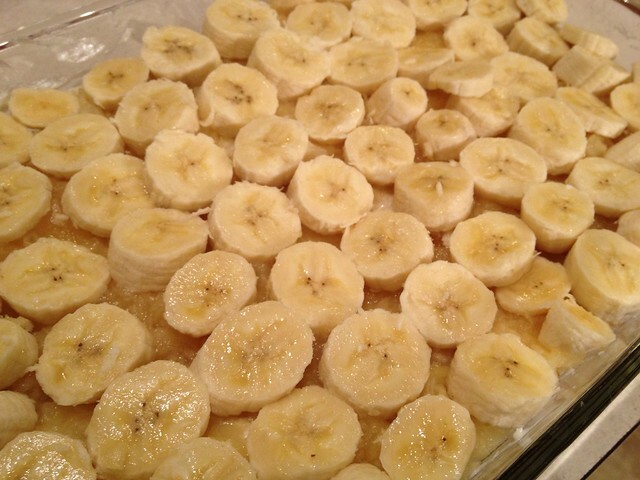 Spread the whipped topping over the bananas, and then sprinkle with chopped walnuts, and top with cherries. Viola! When I say it was a hit…Some people had seconds and I know of at least one person who had thirds. I have zero leftovers. People just love this stuff. Give it a try! Can you believe that 2012 is almost over? It seems like it has flown! Tadd and I are ready for 2013. If it’s anything like the past year has been, then we are in for some good stuff. Can’t wait to find out! Instead of a typical year in review post, I thought I would share my top 5 most popular project posts of the past year. I always find it interesting to see what posts people like to read the most. And it’s always fun to reflect on all I have done in the past year! 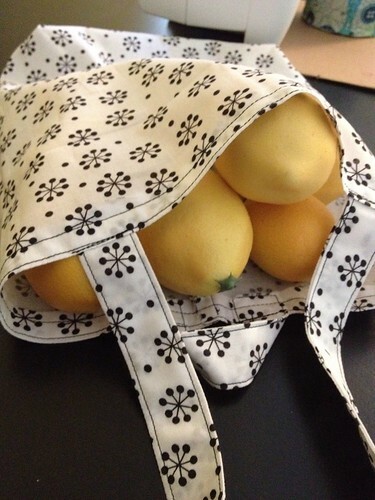 This reusable produce bag was one of the first sewing projects I completed at the beginning of this year. I believe it was the first time I boxed a corner! And it was one of the first projects that seemed to go really smoothly from start to finish. Successes like these are what encouraged me to keep going with teaching myself how to sew this past year. 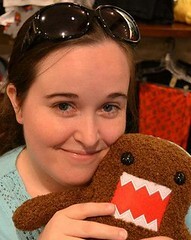 And on top of that, it’s just plain cute! 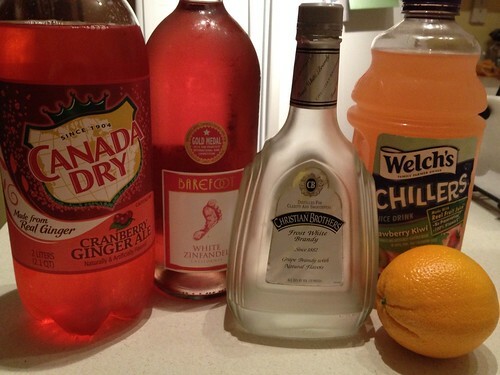 I love a good sangria recipe. 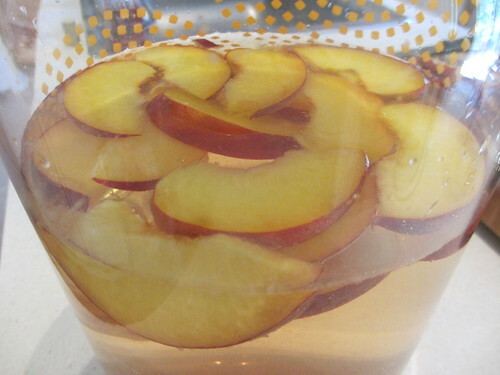 And although I do love this very popular pink sangria recipe that I made last May, I think my all-time favorite version is the peach sangria I made over 4th of July weekend! It’s my new go-to summer drink of choice. If you know me, you know that fall is my favorite season. When I saw this adorable fall fabric at JoAnn Fabrics, I knew I had to think of a project to make with it. 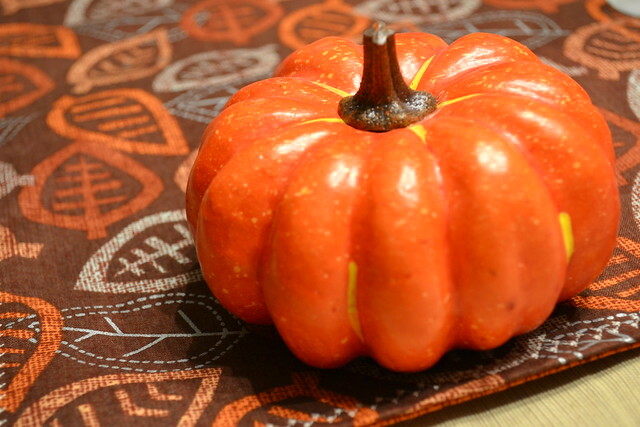 This lead to this reversible fall table runner, which was my very first ever sewing project where I made something just based on what I wanted, as opposed to following someone else’s tutorial. It was also the first time I used a decorative stitch. It obviously wasn’t anything super complicated, but I was still so pleased with how it turned out. 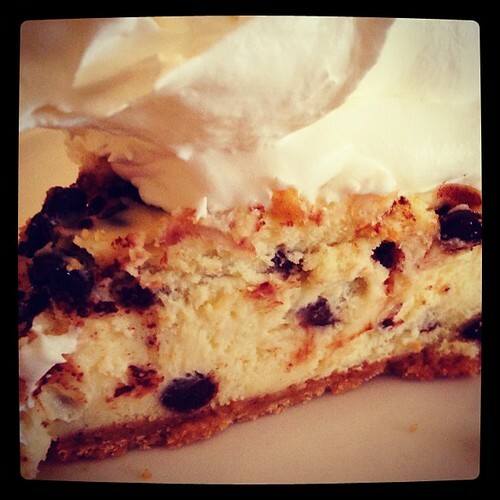 My chocolate chip cheesecake post from last spring has REALLY taken off in the past several weeks. As I mentioned previously, this recipe has been pinned and repinned a TON of times now. It’s super easy and doesn’t require a lot of ingredients. 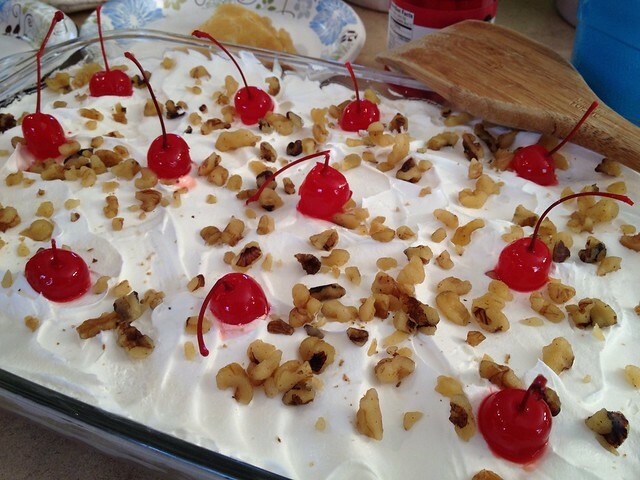 I not only made it for Easter 2012 dessert, but made it again last week for our family’s Christmas dinner dessert! It’s always a big hit. This is, no question, the most popular post EVER on my blog. It’s the closest thing I have gotten to going viral and it still gets a ton of hits almost every single day. As a matter of fact, this post has gotten more pageviews than my blog’s regular main page! 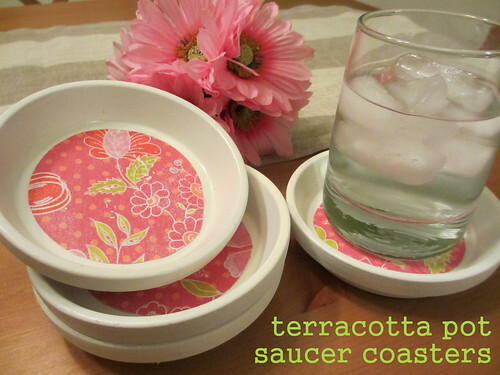 Everyone loves these terracotta pot saucer coasters. I’m glad everyone loved this project as much as I did, although I certainly did not come up with the idea. 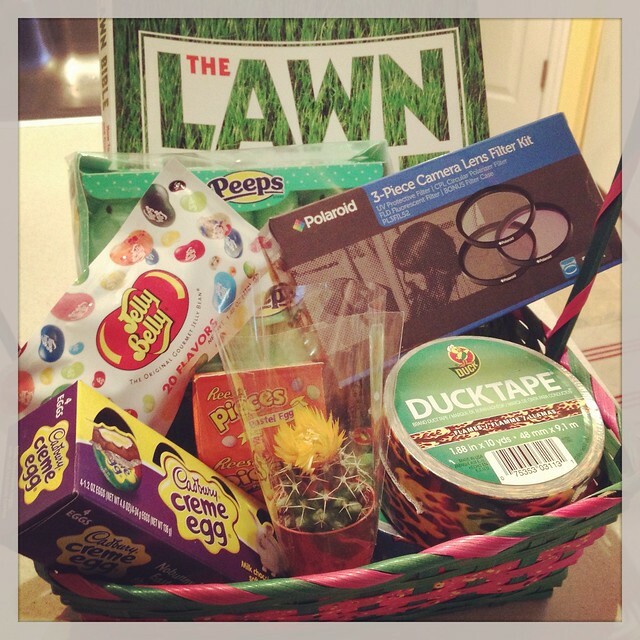 I was inspired by this great post from the Joy Is At Home blog, and she was inspired by someone else and so on. What were your favorite projects that you completed in 2012? Any goals or ideas for 2013 projects? Pretzel turtles and a bow wristlet! Wanted to share two quick last-minute Christmas projects with you before I return to my pre-holiday to-do list! 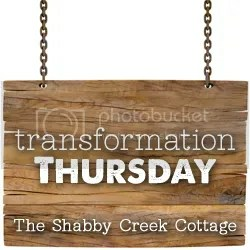 This idea can be found in about five zillion versions on five zillion blogs and Pinterest pins. I used this version from thehungryhousewife.com. 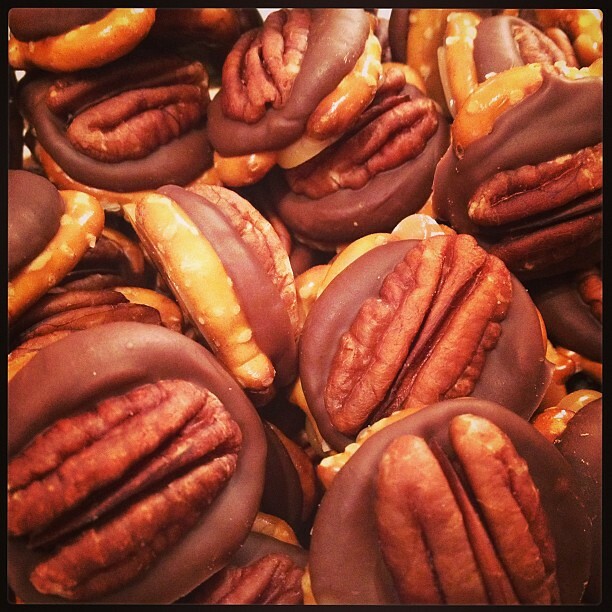 All you need are mini preztels (the waffle shapes or the traditional twists), Rolo candies, and halved pecans. Toast the pecans for 7 minutes in a 350F oven. In the meantime, lay out your pretzels on a foil-lined baking sheet and top them with the Rolos. Stick the Rolo-topped pretzels in the oven for 5 or so minutes, then smoosh a pecan half on top of each melty Rolo. Viola! I was worried that they would stick to the foil, but I put them in the fridge to firm up overnight, and this morning, they popped right off of the baking sheet. Can’t get much more effortless than that. I have seen other versions using Hershey Kisses (the white chocolate candy cane ones work great) topped with red and green M&Ms. Second project is a sewing project. 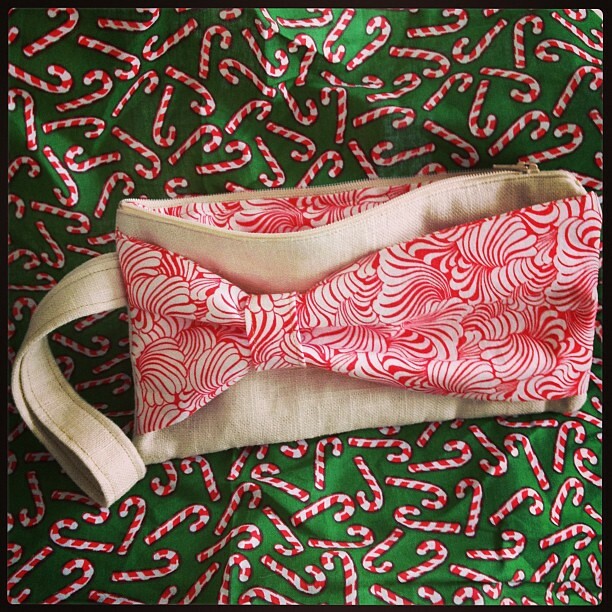 I wanted to make something special for a relative that will be in town for Christmas, so I decided to make her a wristlet. But I wanted to do something different from the wristlets I have done in the past. I found this tutorial from elmstreetlife.com, and decided to make it my own by using natural linen for the body, and one of my favorite quilting cotton fat quarters (beefed up with some medium-weight interfacing) to give a two-toned look. I really love the size of this wristlet. I might have to make one for myself. I hope she likes her gift. And with that, I am signing off until later this week. Off to make my cheesecake and finish cleaning the house! I am hosting Christmas Eve for my family this year, and have been looking for some good finger-food style desserts to serve. 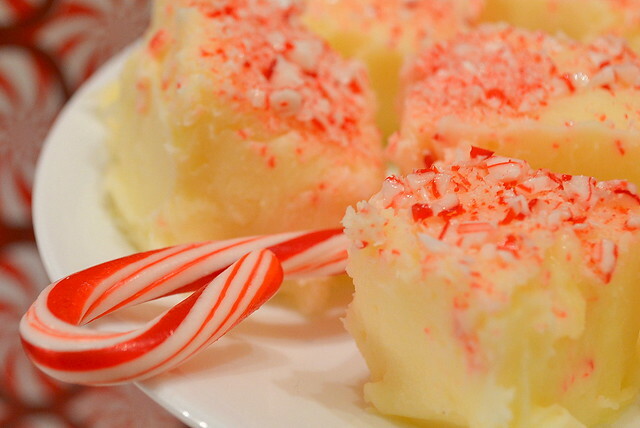 I ran across this post from CentsationalGirl.com with a great recipe for white chocolate mint fudge inspired me to give it a try with one small tweak…I decided to use crushed candy canes instead of the green icing. I thought it came out great. 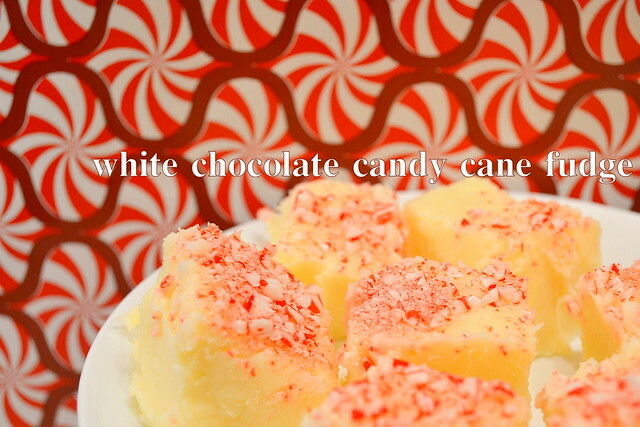 I love holiday treats that look as festive as they taste! This will definitely be made for my family holiday gathering. Pour the white chocolate chips into a double boiler (heatsafe glass bowl over a saucepan with a little water in it works fine). The water should come to a boil, and then turn the heat to low. Add the sweetened condensed milk and stir continuously to combine as the chips melt. Add cream cheese, sugar, and peppermint extract. Keep stirring 8-10 mins until everything is melted together and has a frosting-like consistency. 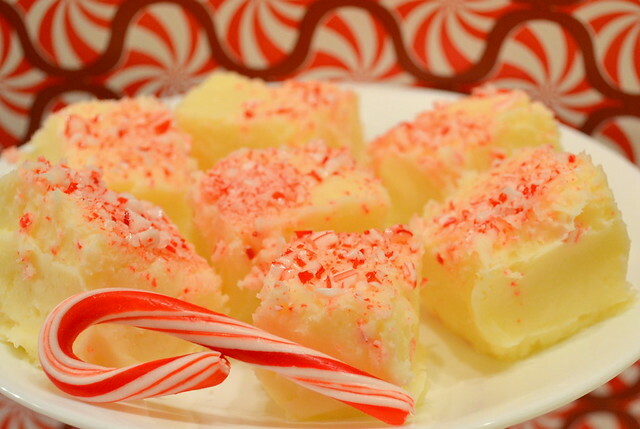 Pour into an 8×8 pan, top with crushed candy canes, and allow to cool and solidify for 6 hours or overnight. Slice into cubes and enjoy! This is one of those great dinner ideas where you can use up leftovers in your fridge. You can take shortcuts or make everything from scratch. Either way, when I tell my husband that this is what we are having for dinner, he is psyched! 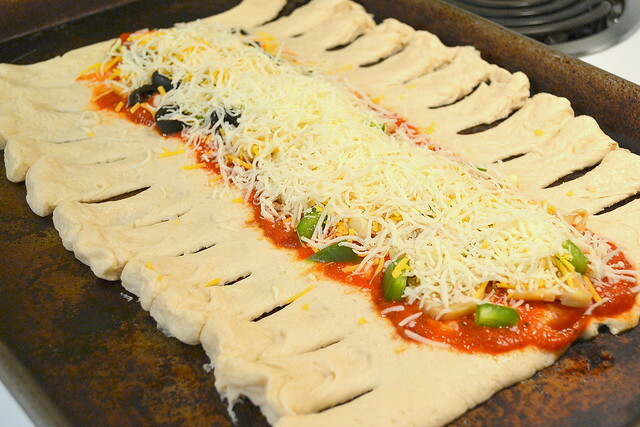 Start with a rectangle of pizza dough (homemade, pre-made, or even the canned stuff), and layer sauce (again, ANY red sauce that you like will be great) and toppings in the middle third of the dough. 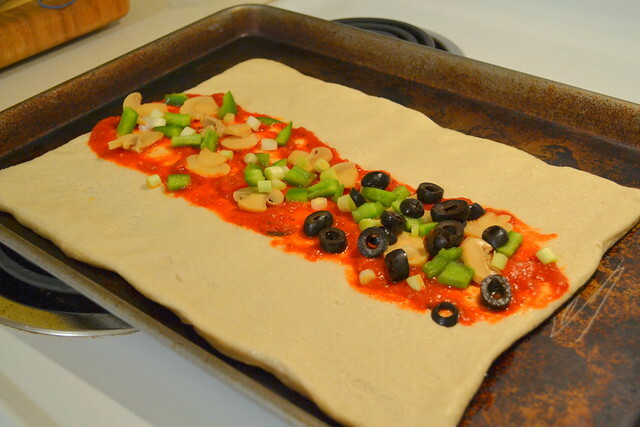 I used some mushrooms, green pepper, some green onions, and black olives (only on my half though…as my husband thinks that olives are the work of the devil). I pretty much just raided my pantry and fridge…almost everything was leftover from dishes made over the past few days. 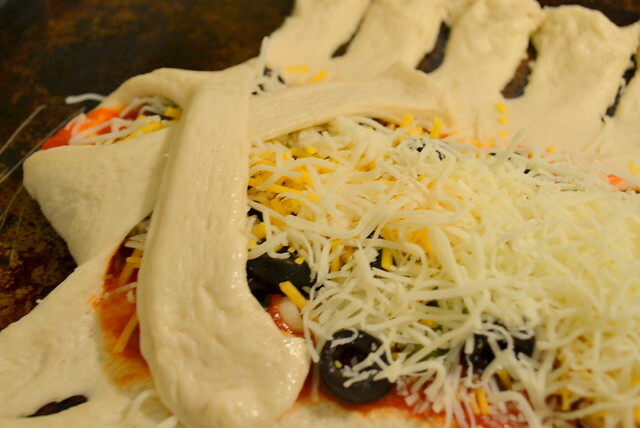 Top your toppings with shredded cheese! 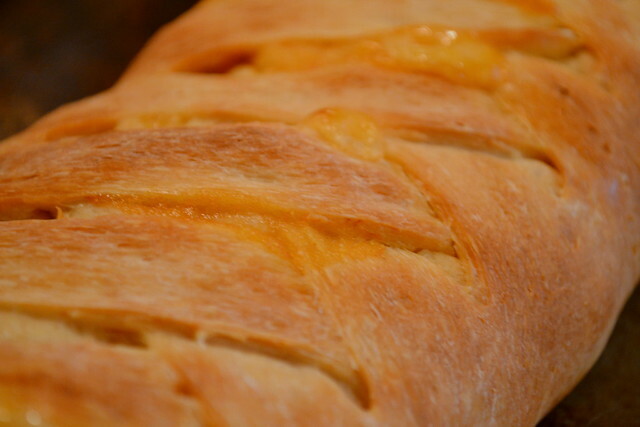 Again, I had some leftover shredded cheddar, so I used some of that along with some more traditional mozzerella. My husband loves extra cheese, so he requested I lay it on pretty thick. Now is the fun part! 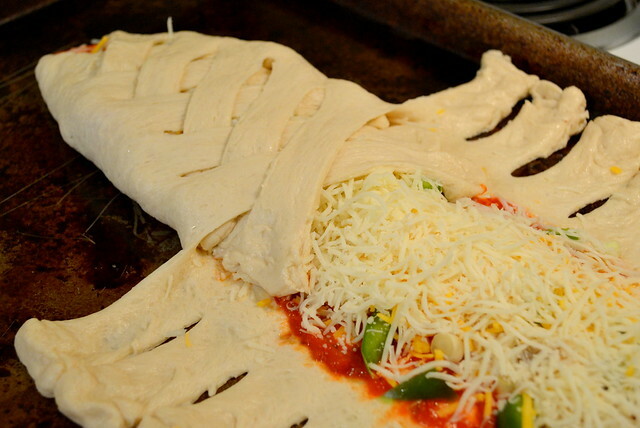 Take the first strip on one side, and bring it diagonally across the fillings and press into the other side. 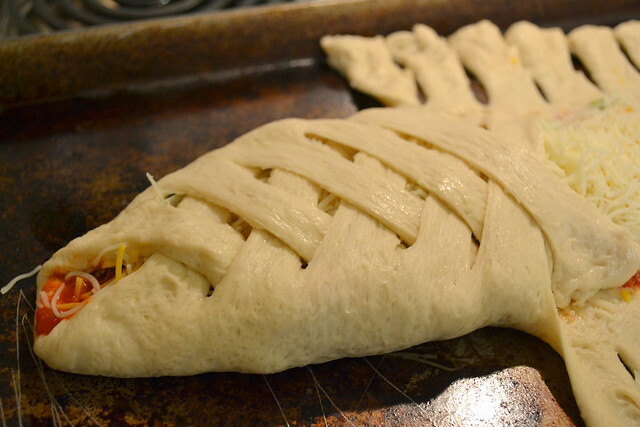 Take the first strip from the other side, and criss-cross it diagonally across to the opposite side. 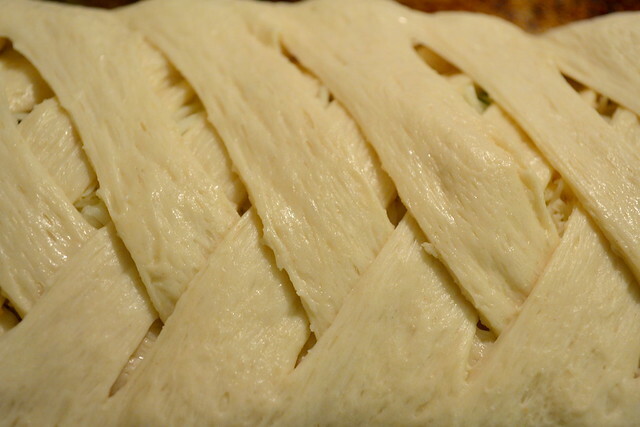 Continue criss-crossing the strips of dough across the filling, alternating sides. 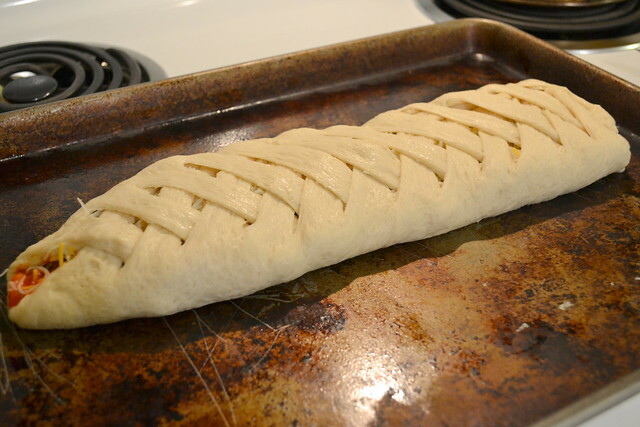 Very quickly, it will start looking really pretty, like a fancy braid. Allow it to cool a little bit. 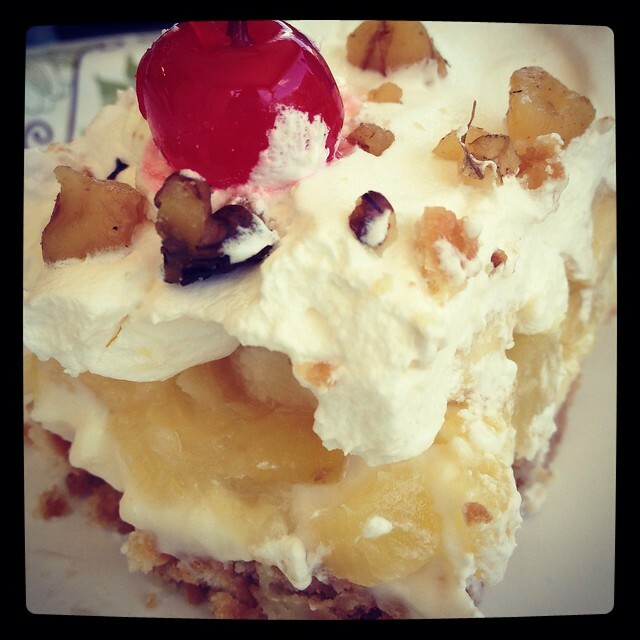 Slice it into your desired portion sizes and enjoy! 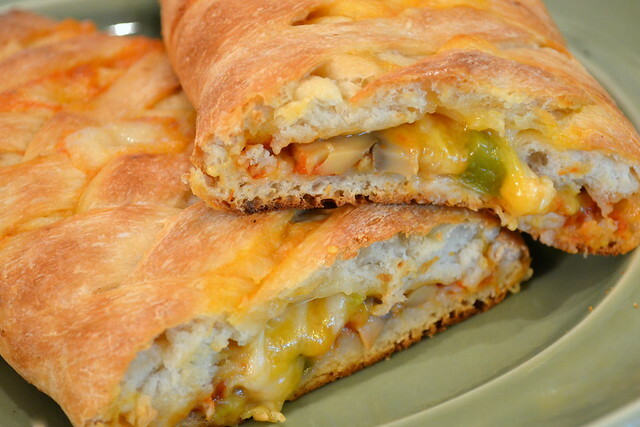 What toppings would you put into your ideal calzone? 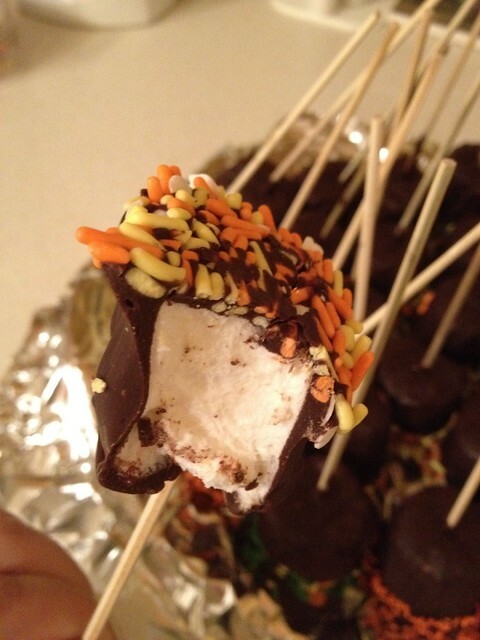 When they mentioned we were having a Halloween potluck at work, I decided to try something new, marshmallow truffles. The concept is fairly simple: dip marshmallows in chocolate and then into any number of toppings. 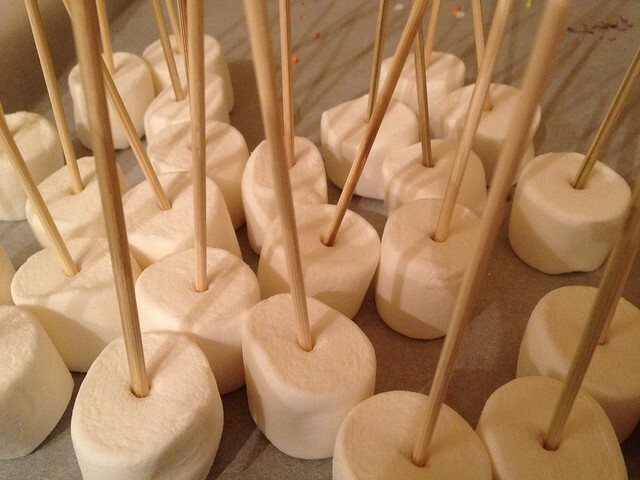 I used small wooden skewers to make dipping and serving a bit easier. I also found some Halloween-themed sprinkles at Target, that I thought made my truffles look pretty festive. You could also use chopped nuts, crumbled cookies, graham cracker crumbs, coconut, whatever you want! 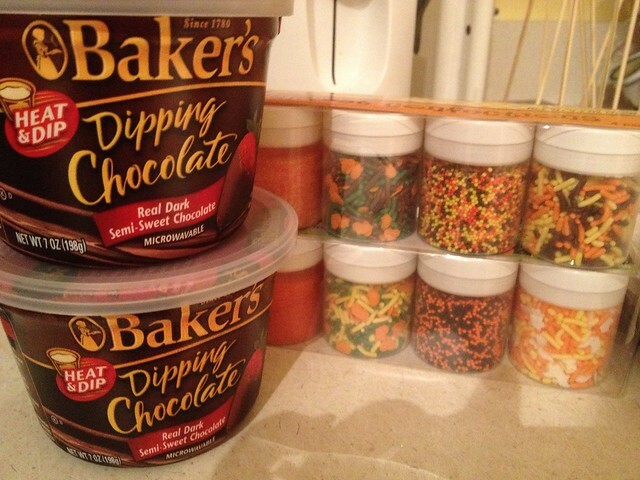 Each tub of dipping chocolate covered about a dozen marshmallows. I think if I were to do it again, I would just buy a big bag of chocolate morsels or bar chocolate. I thought I was going to get more mileage out of the tubs (this was my first time using them). 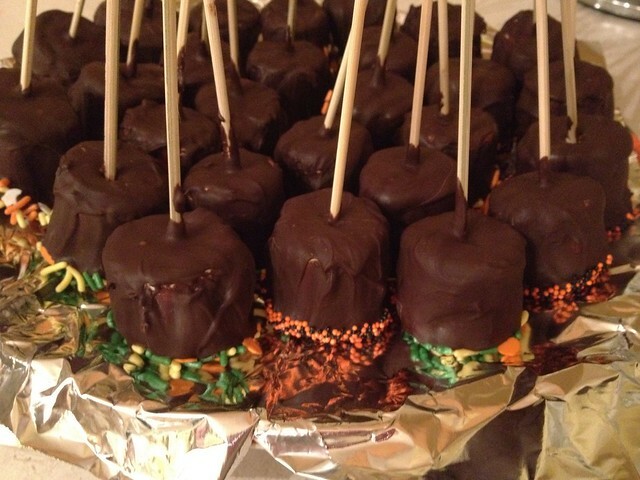 I ended up not using the orange sugar on the left…It just kind of melted into the dark chocolate and looked terrible. 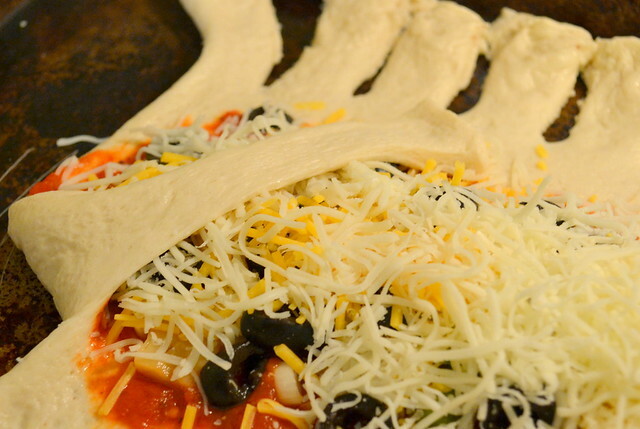 You definitely want toppings that are not too small and not too big. 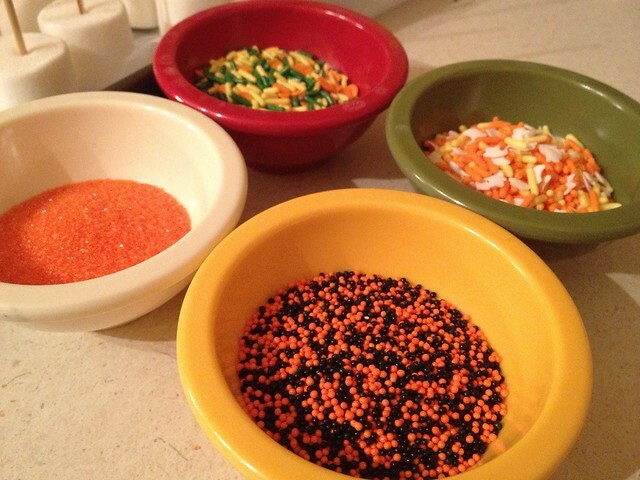 The other three types of sprinkles worked great. This is exactly the type of recipe (if you even really want to call it a recipe) that I love. 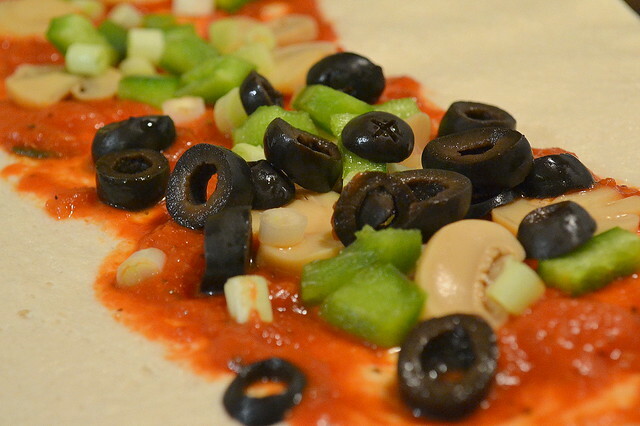 Few ingredients, simple, and lots of ways to customize it. My only issue is that it was quite messy and I felt like I got chocolate everywhere. But that’s pretty much always going to be the case when you deal with melted chocolate. 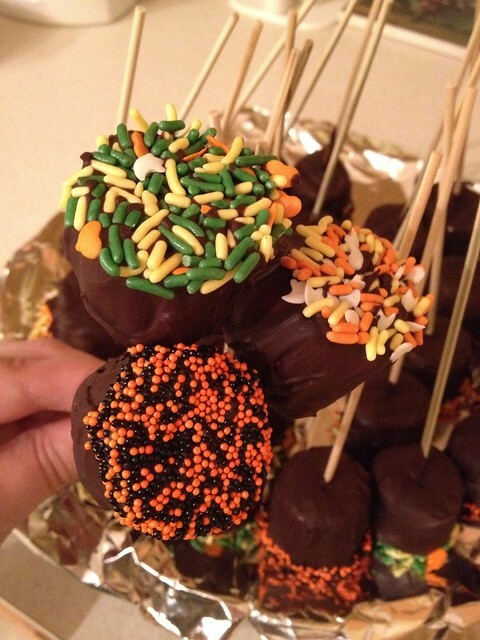 What treats are you whipping up for Halloween? 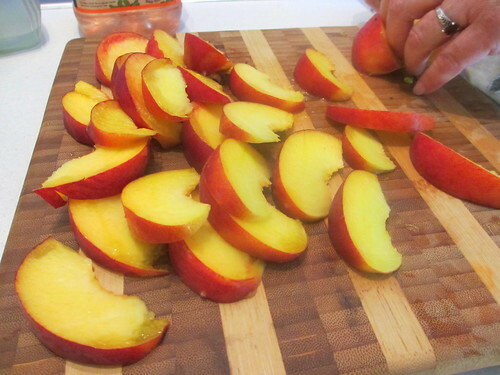 Slice the peaches and place into the pitcher or jug. I estimated two, but one would have been fine. 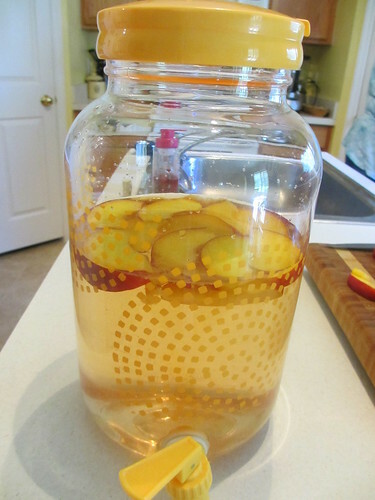 My mother-in-law and I snacked on peach slices while we put the sangria together, so no harm no foul. Just before serving, add the Sprite, and enjoy! 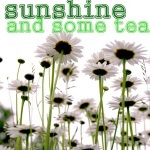 The flavor is slightly sweet, very peachy, and extremely refreshing on a hot summer day! Tadd and I have been cooking together all this week, which has been really lovely. 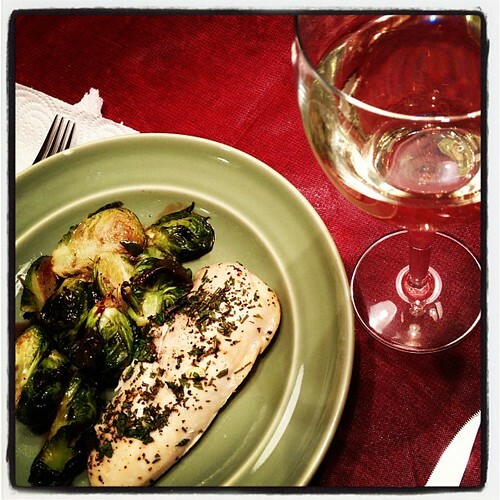 So far our favorite meal that we have tried was a baked chicken recipe with Brussels sprouts on the side, which we made last Sunday night. So good! 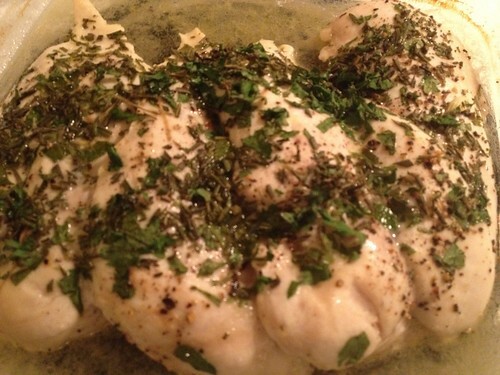 For the chicken, we salted & peppered both sides, then moved it to a prepared baking dish and drizzled with a little olive oil and fresh lemon juice. We then topped the chicken with a combo of parsley and rosemary, poured a little chicken broth around the chicken for moisture, and baked it at 425F for slightly over 3o minutes. 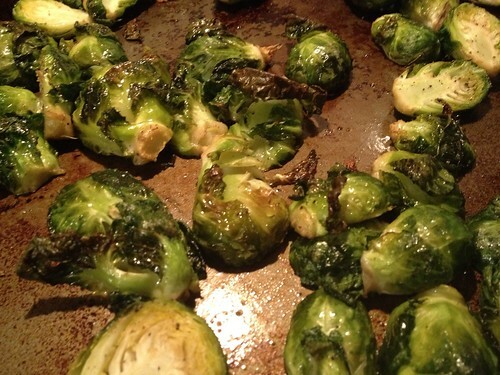 For the Brussels sprouts, we chopped them in half, and spread them on a baking sheet. Drizzled them with olive oil, salt, & pepper (combine them a bit to make sure everything is coated). Then threw them in the oven with the chicken for the last 20 min of cooking. 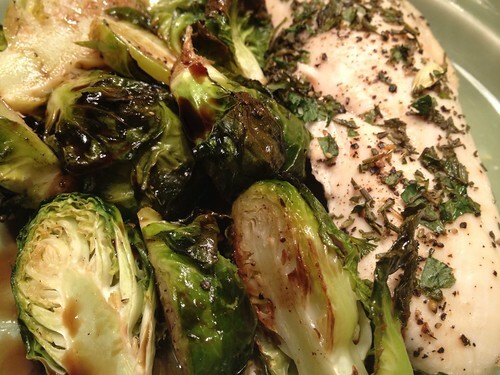 I also found a Weight Watchers recipe for a maple balsamic glaze for the sprouts! 3 tablespoons balsamic vinegar, 2 tablespoons maple syrup, and a little salt, heated gently in the microwave until it thickens. I put it in for 1 minute, then stirred, then 30 seconds more and it was the perfect consistency. Drizzle the glaze on your sprouts, or if you’re like me, save a little for your chicken too! The finished product was served with a glass of Rex Goliath Sauvignon Blanc. Delicious! I liked this way more than I thought I would. We were both happy campers. It is definitely sangria season! I know I have mentioned in the past that I love making sangria. I don’t really use a recipe, I just kind of mix up what tastes good, but I do have a basic and very versatile formula that I use to get me started. It’s very easy to add and subtract and substitute ingredients based on my mood or the occasion. 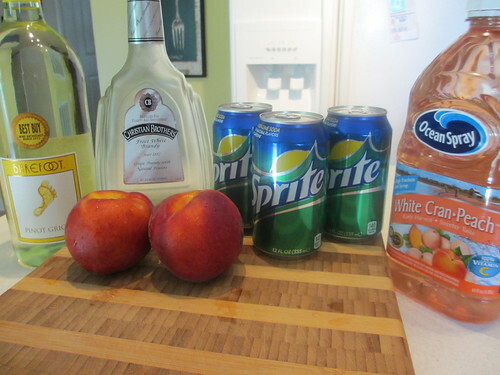 Last summer I shared the basic recipe that I use for classic red sangria. 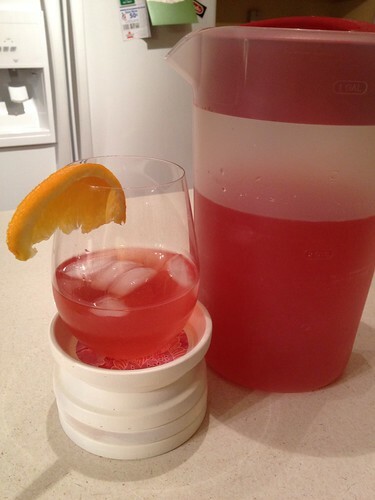 Pour the wine, fresh squeezed orange juice, tropical fruit juice, and brandy into a large pitcher. Let sit a few hours or overnight. Just before serving add the ginger ale (I ended up not measuring and just topping off the pitcher with it, but figure about 2 or 3 cups). Serve over ice. P.S. I have another variation that I have done with equal parts white cranberry juice and pineapple juice instead of the strawberry-kiwi juice, and Sprite instead of ginger ale, and it also turned out awesome. See? Versatile! 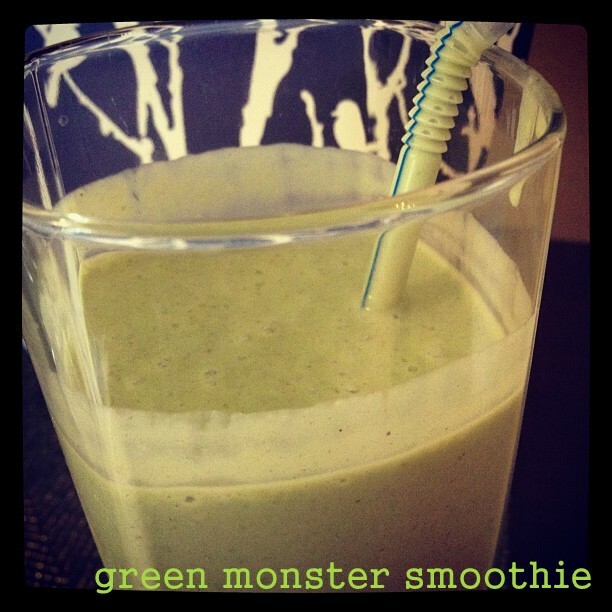 Tadd and I have been trying different “green monster” smoothie recipes lately, and after some trial and error, I believe we have finally found the perfect blend! If you are unfamiliar with green monster smoothies, the addition of spinach might throw you off, but trust me when I say you really can’t taste it at all.